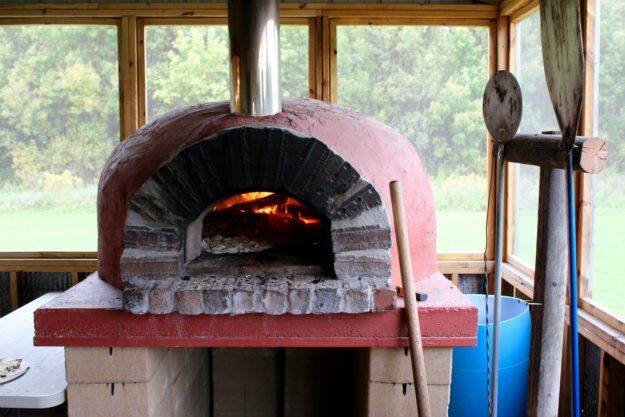 We went with friends to the Pleasant Grove Pizza Farm in Waseca, MN and had the most delightful experience. A couple of winding dirt roads take you there and once you pull up, it’s the most simple and quite frankly, pleasant farm you could imagine. See what I did there? 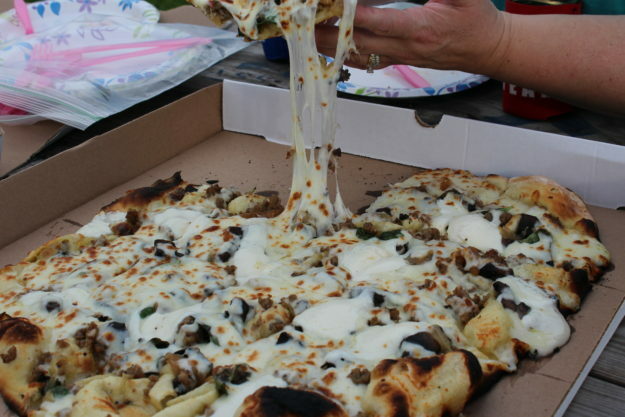 (Pleasant Grove Pizza Farm). A super cute and simple farm setting makes for just a delightful outdoor dining experience on a ‘clean farm’. This means you take your garbage with you when you leave. 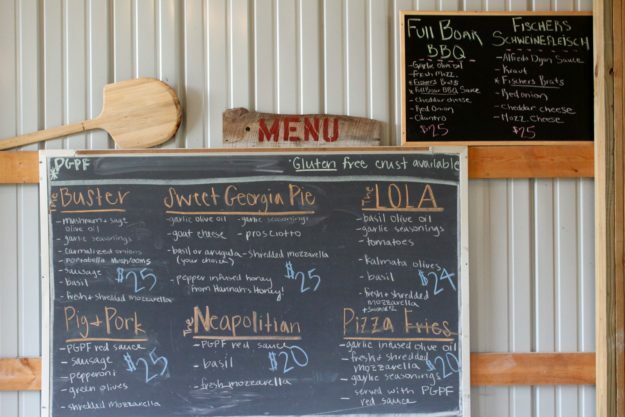 Upon arrival at Pleasant Grove Pizza Farm, you park in a field and it’s situated very close to where you’ll order the pizza and pull up some grass to sit. Bring your own chairs or blankets. The farm, including the parking lot, is nice and flat, making it handicapped accessible. 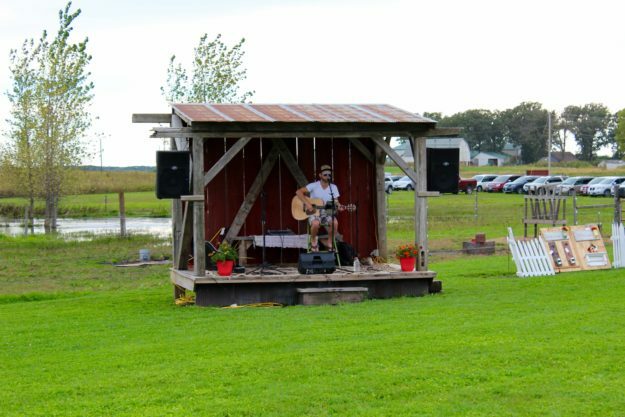 There is an outbuilding that is quite open and has a small stage- assuming they have some entertainment in there at times. This is where you place your order. Once you have placed your order, they give you a piece of paper with your pizza choice and a number. Then when your pizza is ready, your number will be written on a large chalkboard and they ring the dinner bell- this is your cue to come get your pizza. The menu is simple. You can subtract ingredients from your pizza but you can’t add to it. All pizzas are $20 or $25 and feed at least 2 adults. We ordered for The Buster– Basil infused olive oil, spicy sausage, caramelized onions, portabella mushrooms, basil, garlic salt, fresh and shredded mozzarella. It was a very good choice! The crust is just perfectly thin and crunchy. The fresh mozzerella makes all the difference. 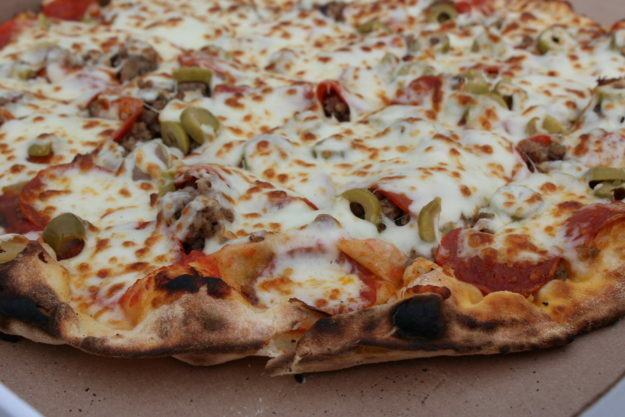 Our friends ordered the Pig + Pork : Red sauce, spicy sausage, pepperoni, green olives, shredded mozzarella. The Pig + Pork was also a very good pizza. The green olives are so good and we don’t order our pizzas with green olives enough. You bring everything you need with you to the farm- napkins/plates if you desire and your own drinks. We saw people with snacks they brought in addition to the pizza they ordered as well as their own pop, water, wine or beer. You bring your blankets or chairs to sit on and if available, they have big wooden spools available to use as tables. You just need to spin it over to your seating area. There is an open area for frisbee or other yard games and plenty of space for kids to run around. 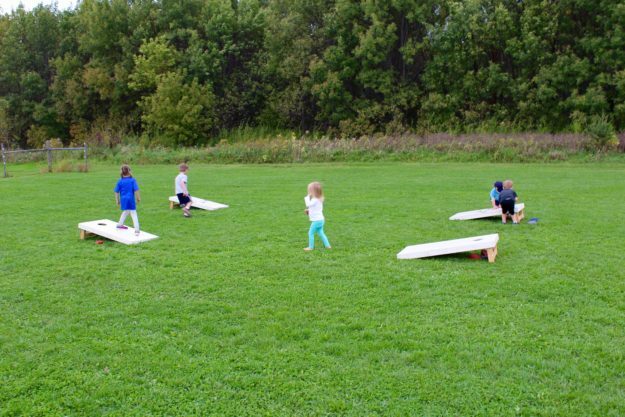 Bags boards are all set up and waiting for anyone who wants to play. 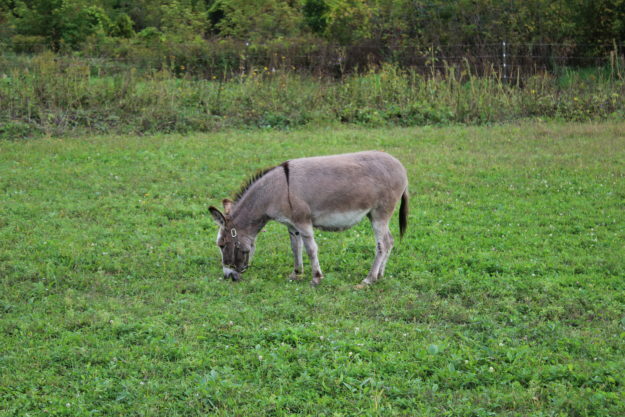 Visit the llamas, goats and donkeys. The animals are situated right behind a small stage where there is live music. You can see the parking lot behind the stage as well. It’s a very compact area, giving easy access to everything. 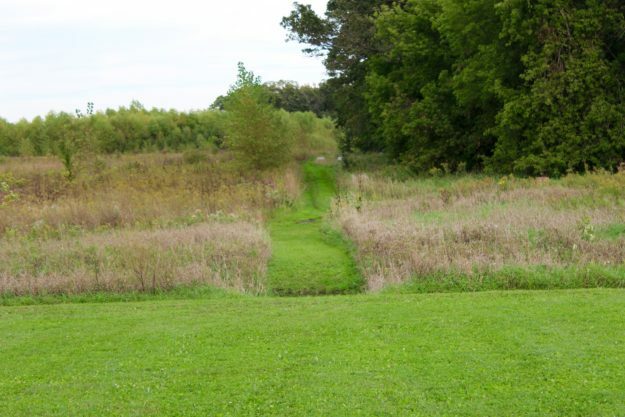 There is also a nice trail for a little walk if you so desire. There is also a small area for vendors where you can purchase crafts, local honey and baked goods or gems. 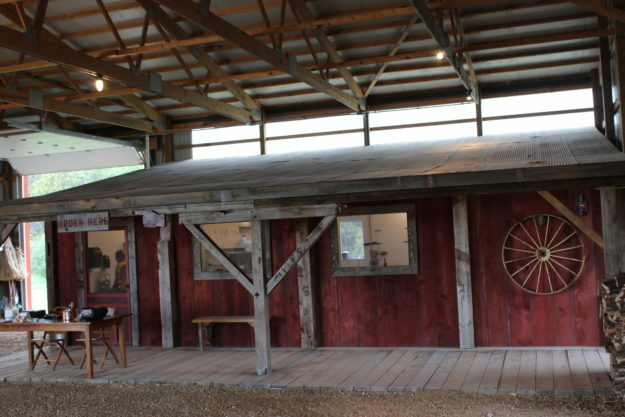 The farm also clean outhouses, including a handicapped outhouse, for anyone who needs to use the facilities and a real sink with running water to wash your hands. It was a lot of fun. A very nice and relaxing way to spend a few hours and enjoy some delicious pizza. We plan to visit again with our family. 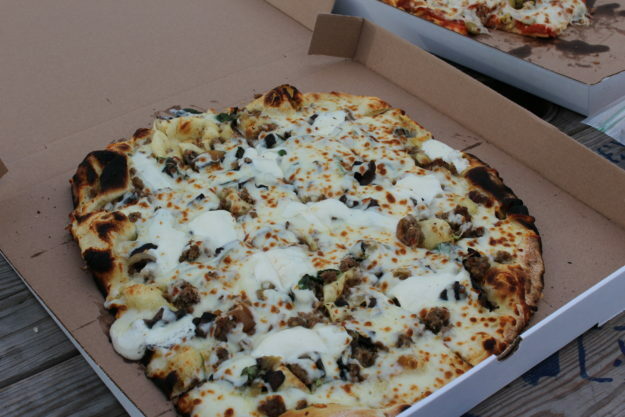 If you plan to visit Pleasant Grove Pizza Farm in Waseca, MN, we suggest visiting their website where they detail a list of what to bring as well as directions and business hours. Very cool! Love that it’s so close to Mankato… might have to go (we always go to Morgan Creek Vineyards for outdoor pizza bc wine 🙂 but I’ve been wondering about this place and if it was any good! I was just saying to Dusty that we need to go back to Morgan Creek- it’s such a great place! Pleasant Grove was very neat- we really enjoyed it! Saved this post. I am SO there. That pizza looks incredible. Risa- it was so good! Please let us know what you think of it! 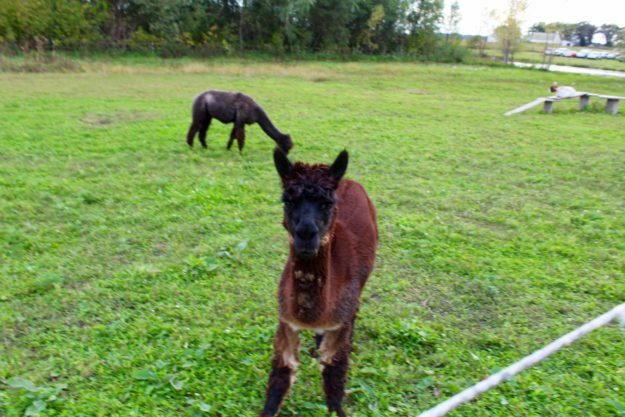 It’s been on my bucket list to get to a pizza farm one of these summers, I love the look of this one, I think my son would love the animals! I’ll check their website to see if I can get there yet this Fall! 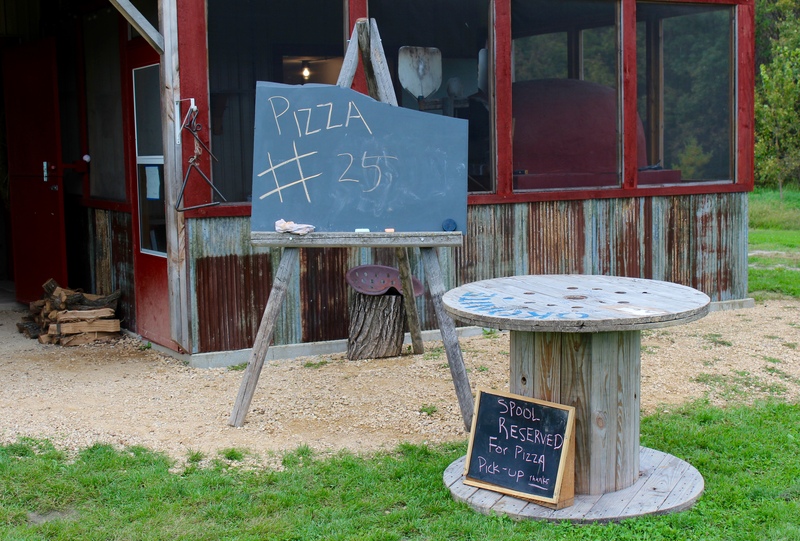 This was our first time at a Pizza Farm and we really enjoyed it! Such a pleasant experience (punn intended!). Let us know if you try it- would love to know what you think of it. I’ve heard a lot about this place but I haven’t been yet. I liked reading your detailed review! The place looks like so much fun. I’ve heard of pizza farms before but I’ve never really thought to go before. Do you know if they make any pizza’s for people with food allergies? It was a really great experience. I am sorry to say that I do not know if they can cater to food allergies. I am sure you could call and ask.